All public data associated with the state’s failed Amazon HQ2 bid has been released to the public, DEED Commissioner Shawntera Hardy said Wednesday. Her comment came in response to a question about a watchdog group’s lawsuit, which seeks to force the Department of Employment and Economic Development to turn over Minnesota’s Amazon bid. That suit might be on the verge of expanding. Public Record Media, led by documentary filmmaker Matt Ehling, originally filed suit on June 27, hoping to force disclosure of the state’s confidential bid for Amazon’s much-hyped second headquarters. It was “a private entity” — the nonprofit Greater MSP economic development office — that “created the proposal and submitted it to Amazon,” the motion says. Public Record Media already has “all responsive public data” pertinent to its request, DEED claims. As a secondary cause for dismissal, the agency says plaintiffs failed to join a necessary party — Greater MSP — to the litigation. It failed to do so despite asserting that Greater MSP was DEED’s private contractor in the effort, the motion says. The plaintiff has also acknowledged that DEED has repeatedly advised that it does not possess a copy of the bid, the motion states. Since Greater MSP created the bid, the agency asserts, only Greater MSP possesses it. In response to that motion, Ehling said Wednesday, his attorney planned Thursday to ask a judge to join Greater MSP to the suit. Amazon set off a nationwide scramble when it announced it was scouting locations for a second headquarters. Minnesota did not make the list of finalists. Ehling said his group filed its first public data request in October 2017, when that result was not yet known. Its request yielded just two short documents, Ehling said. In May, Ehling requested internal DEED communications. That produced a trove of email traffic, which Ehling says demonstrates DEED officials were deeply involved in shaping and producing the bid. Therefore, they had access to it, he said. At Wednesday’s press conference, Hardy repeated DEED’s assertion that all public information has been released. It is summarized in a single-page legislative letter sent to Amazon CEO Jeff Bezos last year, she said. However, that letter — signed by Gov. Mark Dayton, former Lt. Gov. 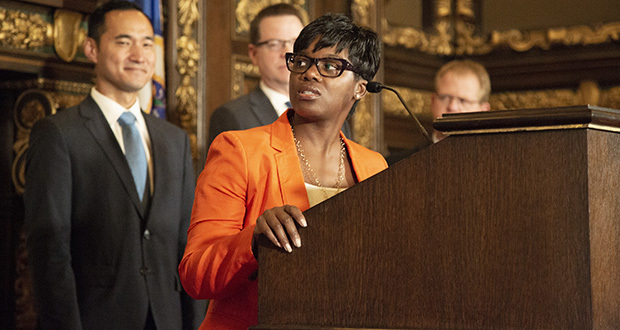 Tina Smith and the four legislative caucus leaders — does little more than sing Minnesota’s praises. It makes only general promises. The letter makes no reference to other, specific incentives the state might offer. Hardy said Wednesday that no such incentives ever were offered. Dayton seconded Hardy’s comments. He said that, just as Greater MSP had no control over any incentives the state offered Amazon, the state has no control over information possessed by Greater MSP. Ehling said he previously queried Greater MSP to turn over bid material but was turned down. The legislative letter referenced by Hardy was one of the two public documents produced after Ehling’s first data request. Together, they were described as the sum total of public data related to the Amazon bid in DEED’s possession, Ehling said. In the second letter, Hardy tells Amazon about incentives that DEED “typically” offers to economic development projects. “An expansion of that size would typically generate a state award of $3 [million] to $5 million from existing DEED programs, in addition to local support as specified in the site proposals,” the letter said. Ehling acknowledges it is unlikely that the state offered Amazon the moon. But he disputes Hardy’s contention that, by releasing two letters and the subsequent email traffic, the state complied with the law — because the actual bid still has not been produced. The letters don’t say whether the state promised tax incentives, general fund revenues or any other incentives in exchange for choosing Minnesota, he said, and those are things Minnesotans deserve to know. Public Record Media is pursing the lawsuit, Ehling added, because DEED is legally obliged to produce the non-proprietary data that it exchanged with Amazon. Dayton was not asked if a scenario like this likely will repeat. The case is scheduled for its first hearing Oct. 16 in the courtroom of Ramsey County District Court Judge Leonardo Castro. Castro was assigned to the case on July 2.